Wholesale Trader of a wide range of products which include ear plug. Low foam mould material ear plug provides excellent grip in dry condition, it can reduce fatigue and have no side effects. Ear plugs of this type can be used in various sectors like Engineering, Petrochemicals, Paper Processing, Drilling. Also there various other sectors where these ear plug can be used are Power Generation, Railways, Airports. 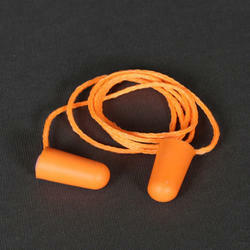 It is suggested that this ear plugs can be worn during the time of sand blasting where high noise is being produced due to the nature of operation. Anti noise ear plug prevents wearer from any discomfort caused from machines producing high noise once in close contact with the external auditory canal it isolates the voice coming into the middle and inner ear which isolate the sound and protect the hearing of the workers, labours in general. Attached with the rope for the convinence of the workers / labourers.